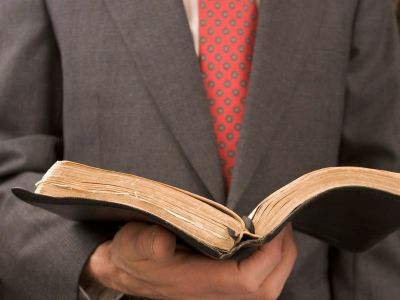 What exactly is a "Fundamentalist Baptist"? A Fundamentalist Baptist is, to begin with, a Baptist. Baptists believe in the public "baptism", ("immersing" in water), of those who claim a personal faith in Jesus Christ alone for their salvation. A Fundamentalist Baptist is an Independent Baptist. Independent Baptists reject membership in religious denominations such as the Southern Baptist Convention, believing instead in "the autonomy of the local church". A Fundamentalist Baptist is also a Fundamental Baptist, which means that he or she believes in the "fundamental truths" of Christianity which were explained in "The Fundamentals", (a series of booklets from the early nineteen hundreds). A Fundamentalist Baptist however, has two additional characteristics beyond that of a Fundamental Baptist. The first of these characteristics is "Biblical Separation" and the second of these is "Christian Militancy". The doctrine of "Biblical Separation" is a doctrine which most Baptists and others shun today. Biblical Separation is a doctrine ("teaching") strongly disliked by New-Evangelicals. New Evangelicalism split away from Evangelical Fundamentalism around 1950, mostly over this issue of Biblical Separation. New Evangelicals did not want to remain separated from apostates and wanted to "dialogue" with those who rejected historical evangelical truth. The leading proponent for New Evangelicalism at time was Billy Graham. During the last sixty years or so since that time, Fundamentalism has mostly died out across America, being replaced by New Evangelicalism. One sub-class within New Evangelicalism is called "Pseudo-Fundamentalism". Pseudo-Fundamentalists, such as the late Jerry Falwell, liked to call themselves "Fundamentalists", but were just New Evangelicals trying to pass themselves off as Fundamentalists. These "wolves in sheep's clothing" Pseudo-Fundamentalists reject either Biblical Separation or Christian Militancy -- and usually both. Because of their cooperation with The Great Roman Catholic Whore, Pseudo-Fundamentalist Baptists and other New Evangelical Baptists are also referred to as "Bapticatholics". Bapticatholics are Baptists who work to support the Pope, and/or Roman Catholicism in some way. The second characteristic of Fundamentalist Baptists which sets them apart from New Evangelicals is their Christian Militancy. Such "Christian Militancy" does not at all mean violence or the shedding of blood. In fact, Fundamentalist Baptists refuse to be violent in a world that so often loves to see violence and bloodshed. In the world's love for violence, many people watch extremely violent movies such as "Kill Bill II"; or the anti-Semitic Mel Gibson's "The Passion of The Christ"; or "The Texas Chainsaw Massacre". Some also pay lots of money to see violent boxing matches on "Pay-Per-View" television. The rejection of violence by Fundamentalist Baptists is in stark contrast to those so-called "Fundamentalist Muslims" who murdered so many Americans in the attack upon the World Trade Center back on September 11, 2001. There of course is no such thing as "Fundamentalist Muslims", since the term "Fundamentalist" dates back to those pamphlets expressing historical Baptist Bible doctrines, and no Muslim believes such doctrines. The news media tends to be rabidly liberal. This is simply a well-known fact established by several studies. Because of the liberal media's strong anti-Christian, (and especially anti-Fundamentalist) bias, sometime around 1980 many in the news media started to call radical Muslims by the term "Muslim Fundamentalists". It was no secret at the time why they did this. They called Muslims "Fundamentalists", in order to deliberately slander Fundamentalist Baptists and other Fundamentalist Christians who take Jesus and the Bible seriously. They had hoped that use of this new term would cause people to think that murderous Muslims were somehow the same, (or in some sense related to), Fundamentalist Baptists. These so-called "Fundamentalist" Muslims (i.e. Koran-believing Muslims) that many in the media were referring to were strongly in favor of both violence and murder. In fact, all true followers of the religion of Islam believe that it is their solemn religious duty, (as directly commanded of them by the Koran), to murder Christians, Jews, and others by beheading or other methods. (Koran: "Strike off their heads till ye have made a great slaughter among them." - Sura 47:4). Those Muslims who refuse to commit such mass-murder, as commanded of them by Mohammed in the Koran, are therefore deliberately disobedient to the Koran. So-called "Radical Muslims" are therefore simply "Koran-believing Muslims", because if they believe the Koran, they will go out and murder non-Muslims as the Koran requires of them. "Christian Militancy" refers to the idea shared by all true Fundamentalist Baptists that "Jesus and the Bible come first." All other authority in the life of a true Fundamentalist Baptist Christian must therefore have a lower priority to the claims of Jesus and the Bible. Furthermore, the government cannot compel a Fundamentalist Baptist to commit any sin. An example of such a sin would be for a government official to order a Fundamentalist Baptist to not spank his or her child. Jesus and the Bible must come first to the Fundamentalist Baptist. Also, a family member cannot make a Fundamentalist Baptist miss church on Sunday, go to Las Vegas, or force a parent to allow his or her child to dance, or to commit any other abominable sin. Once again, Jesus and the Bible must always come first to a Fundamentalist Baptist. All other authority in life must always come after Jesus and the Bible to a true Fundamentalist Baptist. The fact is, Jesus and the Bible always come first to a Fundamentalist Baptist, and so the family therefore cannot come first. Someone who places his or her family before Jesus and the Bible has committed a sin against God by treating something else as being "more important" than God and His Word, the Bible. Jesus himself said that you are not worthy of Him if you commit this great sin of placing someone or something else before Him. This means that you are under the curse of God if you do not love God's Son Jesus Christ. Also, do you love God the Father? Whatever it is that you love more than Jesus is your sin. Give it up. Trust Jesus and He will save you from your wicked sin. Jesus is in Heaven now, sitting at the right hand of God The Father. Jesus is ready to forgive your sins if you will trust Him. Trust Jesus. Then, put "Jesus First" by finding a good Fundamentalist Baptist Church to attend. (Don't be satisfied with one that just calls itself "Fundamentalist" but is actually just a Biblical Separation-rejecting and/or Christian Militancy-rejecting New Evangelical church). Find the "real thing".